Fatigue is a symptom, not a disease, and it’s experienced differently by different people. 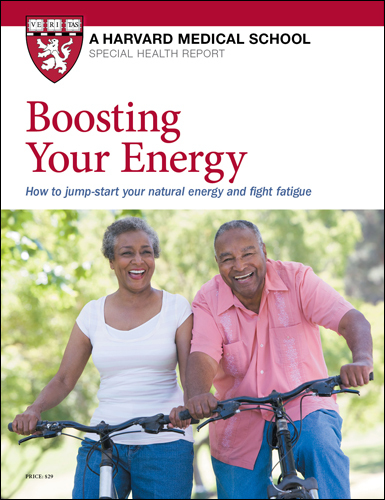 This report, entitled Boosting Your Energy, describes different kinds of fatigue and ways to improve your energy level. For example, the fatigue you feel at the end of a long day or after a time zone change might feel similar to the fatigue resulting from an illness. The difference is that fatigue from stress or lack of sleep usually subsides after a good night’s rest, while other fatigue is more persistent and may be debilitating even after restful sleep. How do you know if your low energy is caused by underlying disease or is the result of lifestyle factors, stress, poor diet, lack of sleep, or normal aging? Harvard’s Special Health Report Boosting Your Energy provides advice and information from world-renowned medical experts to help you discover the cause and find the right treatment or lifestyle changes. It includes a Special Section: A 6-Step Plan to Jump-Start Your Natural Energy. What determines your energy level? Do the “energy boosters” work? It may sound strange, but in order to get more energy, you have to do the very thing you don’t feel you have enough energy to do: exercise. Regular exercise boosts your energy in multiple ways. When you understand how, you will never again think of it as a tedious routine that some health nag wants you to do, but rather as a surefire energy enhancer that you can tap into at will. There are at least four distinct ways that exercise makes you feel more energetic. For starters, when you engage your muscles in any type of exercise, more energy-producing mitochondria form in your muscle cells. Mitochrondria are the cellular powerhouses that convert glucose and fat into ATP, the molecule that cells use for energy. So while exercise burns energy, it also enables muscle cells to produce more energy. But fueling your cells requires more than just glucose and fat. Oxygen is also essential to the process, and exercise increases your body’s oxygen-carrying capacity. Any type of regular exercise creates more capillaries, the tiny blood vessels that ferry oxygen to your cells. But aerobic exercise, by making you breathe the most deeply and increasing your heart rate the most, gets more oxygen circulating. Exercise also affects levels of various hormones and chemical messengers. When you work out, your body releases epinephrine and norepinephrine. In large amounts, these stress hormones cause the energy-draining fight-or-flight response, but in the modest amounts induced by exercise, they make you feel energized. Exercise also boosts levels of compounds called endorphins, “feel-good” chemicals that lift your mood and are often credited for the “runner’s high.” An elevated mood in itself can be an energy booster. Finally, regular aerobic exercise almost guarantees that you will sleep more soundly—a prerequisite for feeling refreshed. Exercise is the only proven way to increase the amount of time you spend in deep sleep, the type that particularly restores your energy. The more deep sleep you get, the less likely you are to awaken in the middle of the night, and the more rested you’ll feel the next day. Exercise also increases the amount of time you spend in REM (rapid eye movement) sleep, the time during sleep when you dream most often and most vividly. More time in REM sleep also restores your sense of energy, though not as much as deep sleep. How exercise improves both REM and deep sleep is unknown, although scientists suspect that it leads to the production of chemicals that affect alertness. In a 2013 poll conducted for the National Sleep Foundation, people who exercised vigorously on a regular basis reported sleeping better than more sedentary people, even though both groups got about seven hours of sleep on weekday nights. Non-exercisers reported the least energy and the most sleepiness. Picture your energy level as a rechargeable battery. You can plug it in and charge it up with exercise, or let it sit idle and watch the energy drain away. When you’re inactive, you lose muscle cells, and the cells that remain have fewer mitochondria. It’s remarkable how little time it takes to see the effects. People who have a limb immobilized because of an injury or illness begin losing muscle cells within just six hours. With weaker muscles, everything you ask your muscles to do requires more effort, leaving less energy for other activities. It’s particularly important to keep exercising as you age because muscle mass tends to decline over the years. Sarcopenia, the gradual decrease in muscle tissue, starts earlier than you may realize—around age 30. The average 30-year-old can expect to lose about 25% of muscle mass and strength by age 70 and another 25% by age 90, with resulting effects not only on energy, but a host of other diseases. Lack of exercise also causes changes in your heart and lungs. They become less efficient at oxygenating your blood and pumping that blood (along with nutrients) to all parts of your body. That in turn affects your energy level, most noticeably during periods of physical exertion. Compared with an active person, a sedentary person experiences more fatigue when carrying out a physically demanding task and has both a higher heart rate and lower oxygen consumption. Inactivity also has psychological effects. The less active you are, the less active you want to be. People who don’t exercise have a greater perception of fatigue than people who do. I bought the ebook and I can't download it.